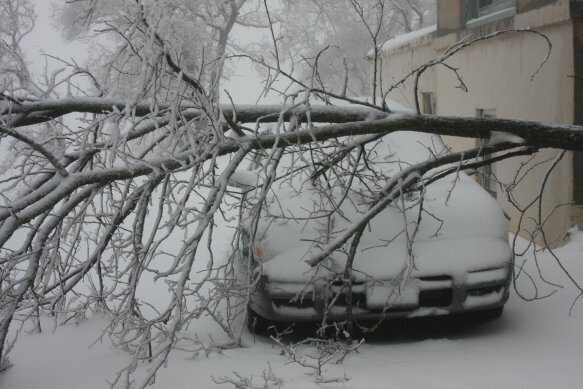 Tree Speak | Casey Trees: THE BLIZZARD IS OVER. NOW WHAT? A record amount of snow fell in the District this past week. I felt each inch through my non-waterproof boots. Each inch. Now that the snow has stopped falling and the City digs out we can turn our attention to the trees that have taken a beating and remind ourselves of best practices to ensure surviving trees can withstand future snow and rain storms. If you noticed a street tree with any damaged limbs or was completely fallen call the Citywide Comment Line at 311. Be ready to provide them with a street address or intersection of where the damaged tree is located. You will be given a reference number that will allow you to track the request. If the damaged tree is on private property, the property owner is responsible for the care or removal of the tree. It is important that damaged trees be promptly examined by a certified arborist to determine its structural stability, prevent or treat infection and/or provide restoration pruning. While lawn care professionals are great and potentially more affordable than arborists, they are not tree experts. Think about it. You wouldn’t have a dentist remove your kids tonsils just because they have a knowledge of how tonsils work and offer you a better deal. To find a certified arborist in the DMV area, visit the International Society of Arboriculture website. You can search for an arborist by last name, postal code, location or certification id. What do you risk if you do not hire a professional? Time, money and the life of your tree. If a large tree has lost or damaged branches, its food source may irreparably damaged. The amount of food a tree can generate for itself is based on its leaf surface. Less leaf surface, less food. Simply removing the branches may be futile if the tree will not be able to sustain itself. A certified arborist can tell you the likelihood of it surviving. A tree can also generate several sprouts to compensate for the loss of branches. These shoots compete with one another for nutrients and threaten a tree's structure and stability. A certified arborist will be able to select which shoot to make the lead and over time prune the rest. Lastly if a branch break is left exposed you are putting out a welcome mat out for infections. Remember, trees are just like any other living organism and can develop infections. They are not immune. A certified arborist can determine where to cut the branch back to so the most foliage – its food maker - can be kept. As the snow melts flush the area around the trunk of street trees with running water to help wash away some of the salt-based deicing agents used on streets and sidewalks. If left, the salt can equalize out the moisture in the soil robbing the tree of water. The primary take away today is to evaluate trees on and around your property for damage. Report damage to street trees to 311 and contact a certified arborist to examine trees on private property. On Wednesday I'll tell you how Casey Trees can help you replace damaged or fallen trees and even add new ones through the RiverSmart Homes, Tree Rebate and Community Tree Planting programs. Feel free to click on the name of each program to learn more now.